Pretty much everywhere I go lately, someone asks me, “Have you read The Help?” “No,” I reply, “I’m waiting for the movie.” Not only will seeing the movie save me time, it will also showcase my neighborhood, the hippest, coolest neighborhood in Jackson. I refer, of course, to Fondren. (My neighbors and several friends will also be appearing in what I’m told is “the shower scene” which I assume means a wedding or baby shower, not an actual shower like you would take in the morning). In fact, my favorite local blog, Photos From Fondren recently noted that setup work is about to begin on North State Street in “downtown Fondren” to take it back to its c.1960 appearance. This reminded me of a great little article I came across a while back in the old State-Times newspaper, dated July 22, 1956 and titled “Fondren is City’s Oldest Suburban Business Center: Has Jackson’s First Branch Bank.” It caught my eye because it has a sweet little hand-drawn map; I wonder if the map was drawn by one of the several Jackson architects based in the Fondren area–Frank Gates, Bob Henry, Tom Biggs, William Gill are a few that come to mind. FONDREN: TOWN INSIDE A TRIANGLE. Had not greater Jackson grown so rapidly, the above map represents an area no bigger than a triangle bounded by the equivalent of three long city blocks which might have become the heart of a little city of its own . . . Fondren. However, this area IS Fondren, Jackson suburb, and the map indicates the general aspect of what is Fondren today with a few glide-posts thrown in around the triangle. This is one of the most unusual areas in greater Jackson due to the large variety of facilities so compactly knit together–three churches, one elementary school, a branch post office and two branch banks, along with other commercial firms. The map reveals two of Fondren’s newest developments. The opening of the Gibbons Smith Studio, in a new building and the removal from North State to Old Canton Road in a large new modern hardware supermarket of the Montgomery Hardware company. The Dale office building is planned for an eventual six stories and may be the first suburban “skyscraper” in Jackson. Fondren, which has its own honorary mayor and two city commissioners is Jackson’s oldest suburban business district showing some of the city’s latest and largest commercial growth. Montgomery Hardware (1956) with its original neon sign is the lower white building to the left. The old A&P is now the Rainbow Co-op. This is evidenced by the three-day grand formal opening of the Montgomery Hardware Company, Old Canton Road next to A&P, in a large, new, ultra-modern brick building, 40 x 160 feet constructed by druggist A.E. Brent, and Sherman Noble as evidence of their faith in the future of Fondren. However, such faith was also evidenced by E.E. Morgan, who 10 years ago opened Morgan Center in Fondren, as Jackson’s first major shopping center, in 1946. Constructed along modern lines, today it remains one of the city’s largest and most modern shopping centers at a time when shipping centers are springing up everywhere. During these 10 years, only one tenant has left Morgan Center and one new one moved in, reflecting the growing business trend of the area. Another new development in Fondren hard by the Montgomery Hardware Store is the Gibbons Smith Studio, just opened in a new edifice constructed by Earl Bullock. Fondren also boasts two branch banks–the Medical Center branch of the Deposit Guaranty Bank and Trust company, and the Fondren branch of the First National Bank [now Trustmark], both units being ultra-modern and of recent construction. 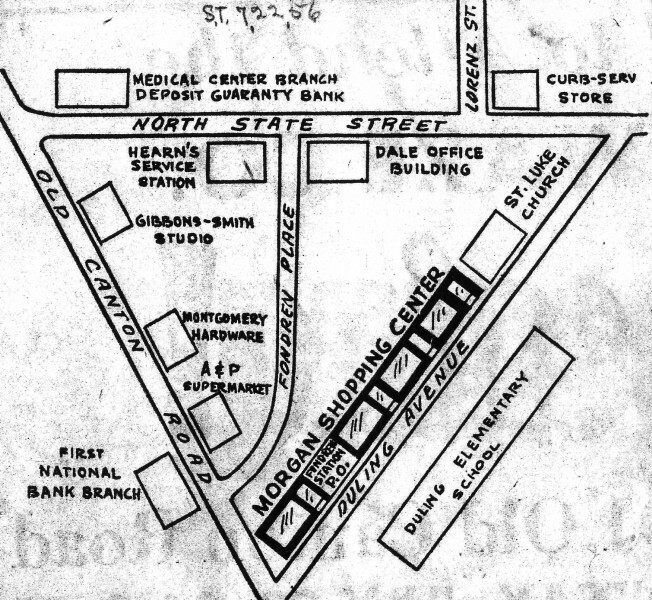 Asa Hatch, of the Medical Center branch of Deposit Guaranty, points out that the original Fondren branch of the Commercial National Bank, opened July 22, 1948, at that time located on the corner of North State and Duling [now known as the Fondren Building] and since merged with the Deposit Guaranty, was the first branch bank in Jackson. The Dale office building in Fondren is the only edifice in the area constructed as an office building. Although only one story high, this new building is designed for six stories eventually. This building, at the corner of North State and Fondren Place, was developed by Earl and Hal Dale and, along with other offices in the building, houses a new branch display room of the Belwood Manufacturing Company, makers and marketers of kitchen equipment for the home. Too, Fondren has its own theater, the Pix on North State. 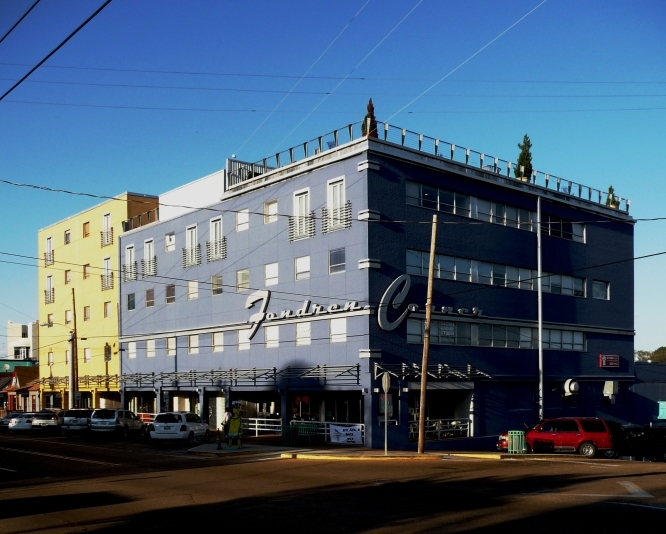 Had it not been for the continuous growth of Jackson, Fondren might have become an incorporated town, but with the growth of the Capital City, Fondren was swallowed up. In fact, even now it is rapidly losing its identity by the name of “Fondren” as Jackson spreads far beyond Fondren in every direction. 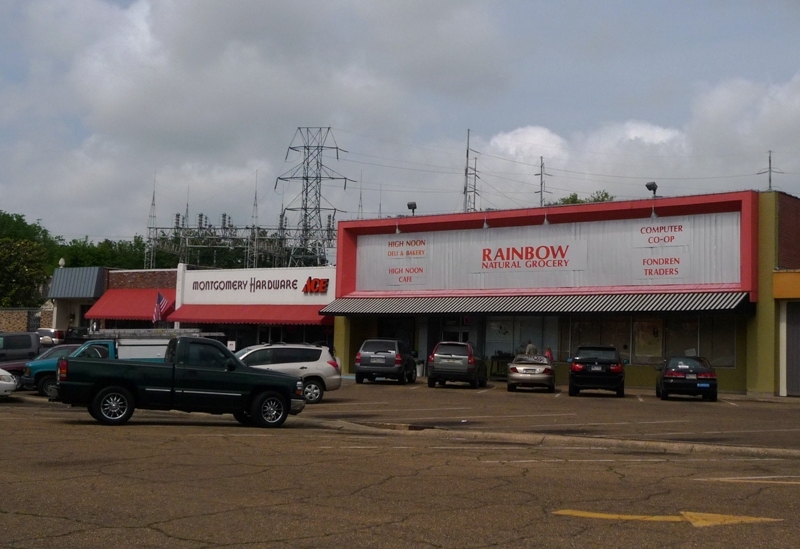 But Fondren is still a business center, mixing banks, post office, shopping center, three churches, and many businesses. I take it you know the little Henry twins are prominent in the movie? That’s right, so I do practically know the whole cast. Most of the filming is taking place in Greenwood. According to the filmmakers and the “Greenwood Commonwealth” Greenwood looks like Jackson used to look in the 50s and 60s. I believe they began filming in Greenwood in July (maybe June). I haven’t read The Help either, though I guess I should to see what all the hype is about. When does the movie come out? Thanks for the shout out for Photos from Fondren. If I can just pick up 1 or 2 more viewers it will double my readership (an all too accurate comment, but I also go for quality over quantity). For those interested in Fondren’s CBD’s integrity, I have a bit of news that is mostly wonderful but somewhat unsettling. The City of Jackson is in the final stages of planning for a comprehensive streetscape impovement. I believe the “clients” are the business association, which is very pro-active and progressive. The scope of work will include an overhaul of pedestrian features…walks, crosswalks, distinctive paving, an elimination of redundant and abandoned curb cuts, the narrowing of an insanely wide side street and installation of street furniture. That’s the great part. The upsetting part is the nature of the signage and light fixtures. The latter are standard issue black traditional “gas lamp” type. The signage is equally…er…pedestrian. The stuff that is used at festival marketplaces etc, where they attempt to ground a spanking-new development in an imagined past. Fodren has a past, and a current, which can be called funky, artsy, hipster-ish, mid-century nostalgia-like, alt-whatever, artisinal. All with a glass of brewbeer. It’s a shame to turn a blind eye to that! Gas lights? in Fondren? And “Ye Olde Street Signs”? Sounds like a standard plan that whatever consulting group pulled off their shelf and replaced the previous town’s name with Fondren. Should be some cool 1940s/50s light fixtures or as you suggest something completely new and modern and artsy, and it seems like it still could be. It’s really a minor aesthetic issue within a much larger infrastructure upgrade (which I think all or most Fondrenites support). Who’s running this project that might be able to make this change? Hmm, in addition to the Victorian lights I have a problem with all those trees in downtown Fondren. I’m a tree-hugger, but not in downtown areas. We only have to look at Capitol Street in Jackson to see the negative results of trees–live oaks, my favorites of all the world, but not meant for such urban spaces. Even smaller trees (and they’re never as small as predicted) end up obscuring the businesses behind them–surely not something business owners would support? and in such tight quarters, the roots can really mess up the foundations of the buildings behind them and the sidewalks and streets–see again Capitol Street, where a walk down the sidewalk can land you flat on your face if you’re not watching carefully. Overall, as I’ve said, I support this project, but the details I see here seem very boilerplate nd not thoughtful to this unique place.